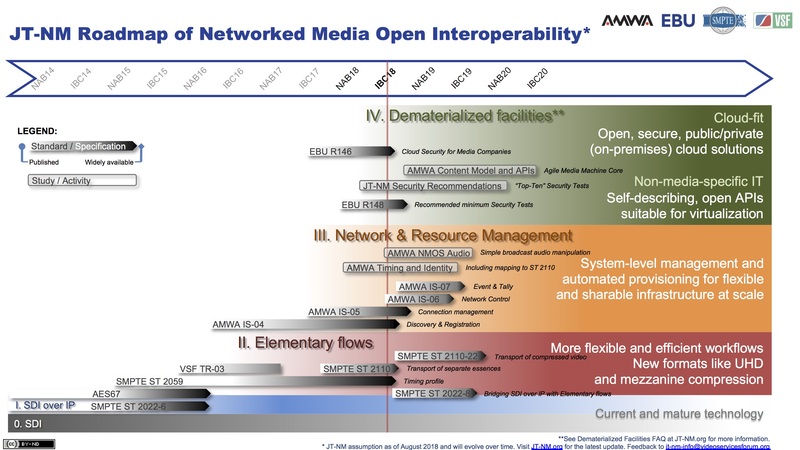 The Joint Taskforce of Networked Media Open Interoperability's Roadmap tracks the standards and specifications that enable the JT-NM Reference Architecture. It shows how the relevant technologies are evolving and makes estimates about when, and to what extent, interoperable multi-vendor systems can be built around existing and yet to be developed standards and specifications. The roadmap is updated biannually to reflect the current state of these technologies and the latest industry insights about future developments. IP-based networks have been common-place in broadcast facilities for a long time – mostly as means to move files around or to control equipment. Today, IP technology underlies most modern production workflows and is the core infrastructure in a growing number of broadcast facilities largely wired with network, rather than video and audio, cables. Fully IP-based production is now a widely adopted industry goal and several European broadcasters are planning, or have completed, facilities spec'd for IP. One important exception up until now is live production, which continues to largely rely on a technology known as SDI. But even there change is coming, as the rallying cry “SDI must die!”, first voiced during IBC 2013, is echoed around TV studios and OB vans. There is a great amount of momentum in the industry – the challenge, and the Joint Taskforce's goal, is to ensure that the technology's full potential is realized through open standards and fully interoperable systems.